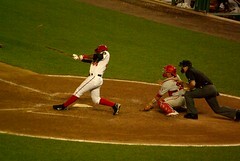 Lastings Milledge was supposed to be the answer for the Nationals in the Outfield. Unless the question was, “So, who are we overpaying for their undisciplined services?” Milledge wasn’t it. So, he’s been optioned to Syracuse, on the heels of Tom Boswell’s suggestion that they do exactly that. Is Boz a candidate for the GM position? Maybe he should be.